What a week this turned out to be! 70 fish from 90 runs and gorgeous weather. A regular, Michael Klaus, was back on swim 1 and after a quiet first night he got off the mark on the second night fishing along the dam wall w...ith 2 fish to 18.7kg. It got better and better from there with another 19.6kg on the 4th night and a 21.5kg on the 5th night. He finished the week with 16 fish including 2 grass carp of 14.6kg and 15.8kg, on a mixture of pineapple or banana boilies and tiger nuts along the dam wall and to markers in open water, overall average 14.25kg. But swim 8 really stole the show for Pieter and Carola (see video). They couldn't have imagined how well their first visit here would turn out. They moved from swim 11 to swim 8 to escape some nasty hornets that were bothering them and they were very glad they did. 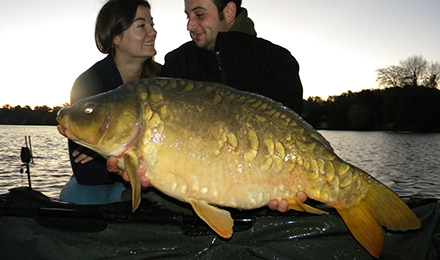 Fishing mainly to the lilly pads and to the margins at the back, 8 runs in the first 10 hours produced fish to 22.5kg. The next 24 hours they had 10 runs and fish to 23.9kg. The following day 9 runs, then 6 runs, and 9 runs, 9 runs again, the fish kept on coming! They finished with 53 carp on the bank from 70 runs including 23 over 14kg (30lbers) 5 over 18.2kg (40lbers) and 2 over 23kg (50lbers) and a new PB each. Some of the carp were really scaly stunners too.Their average overall was 14kg so a great session for them. The second week for Richard, on his own though this week and he moved down on to the chalet swim. This proved to be a good move and he improved on last weeks tally considerably. Fishing tiger nuts again along the dam wall he landed 18 fish, only 1 lost, including 11 over 14kg to 18kg. So that's it for this year for us. It has been a great season, a real pleasure to see the fish... so healthy and gaining weight and so many pretty fish coming on. Our plans for the winter include a new self contained apartment in our house to replace the B&B to provide a cheaper alternative to the chalet for small groups (max 4 persons) so news and photos will follow. We would like to thank everyone for their continued support throughout the year and we will look forward to seeing old friends and new next year.